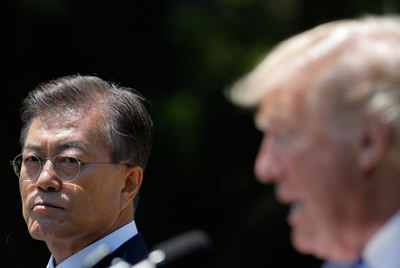 The United States has pressured the new president of South Korea, Moon Jae-in, into allowing more missile and radar weaponry into the country and more war games into the skies near the border of North Korea. But Moon has drawn the line at actual war. "The government, putting everything on the line, will block war by all means," he said. We agree with you that war must be avoided, diplomacy pursued, and peace allowed to prevail. 19702 1 year ago rune olwen Neumünster, ot , DE Please do not start Worldwar 3! 19691 1 year ago Anonymous Ringwood, NJ , US Please support peace. 19690 1 year ago Nora Nash Aston, PA , US Peace is God's gift to each of us. Let us send peace vibes across the globe to all our brothers and sisters.